The immune response mechanism is the holy grail of the human defense system for health. IDO, indolamine 2, 3-dioxygenase, is a key gene for homeostasis of immune responses and producing an enzyme catabolizing the first rate-limiting step in tryptophan degradation metabolism. The hemostasis of immune system is complicated. In this review, the properties of IDO such as basic molecular genetics, biochemistry and genesis will be discussed. IDO belongs to globin gene family to carry oxygen and heme. The main function and genesis of IDO comes from the immune responses during host-microbial invasion and choice between tolerance and immunegenity. In human there are three kinds of IDOs, which are IDO1, IDO2, and TDO, with distinguished mechanisms and expression profiles. , IDO mechanism includes three distinguished pathways: enzymatic acts through IFNgamma, non-enzymatic acts through TGFbeta-IFNalpha/IFNbeta and moonlighting acts through AhR/Kyn. The well understood functional genomics and mechanisms is important to translate basic science for clinical interventions of human health needs. In conclusion, overall purpose is to find a method to manipulate IDO to correct/fix/modulate immune responses for clinical applications. The first part of the review concerns the basic science information gained overall several years that lay the foundation where translational research scientist should familiar to develop a new technology for clinic. The first connection of IDO and human health came from a very natural event that is protection of pregnancy in human. The focus of the translational medicine is treatment of cancer or prevention/delay cancer by stem cell based Dendritic Cell Vaccine (DCvax) development. IDO is a key homeostatic regulator and confined in immune system mechanism for the balance between tolerance and immunity. This gene encodes indoleamine 2, 3-dioxygenase (IDO) – a heme enzyme (EC=1.13.11.52) that catalyzes the first rate-limiting step in tryptophan catabolism to N-formyl-kynurenine and acts on multiple tryptophan substrates including D-tryptophan, L-tryptophan, 5-hydroxy-tryptophan, tryptamine, and serotonin. The basic genetic information describes indoleamine 2, 3-dioxygenase 1 (IDO1, IDO, INDO) as an enzyme located at Chromosome 8p12-p11 (5; 6) that active at the first step of the Tryptophan catabolism. The cloned gene structure showed that IDO contains 10 exons ad 9 introns (7; 8) producing 9 transcripts. After alternative splicing only five of the transcripts encode a protein but the other four does not make protein products, three of transcripts retain intron and one of them create a nonsense code (7). Based on IDO related studies 15 phenotypes of IDO is identified, of which, twelve in cancer tumor models of lung, kidney, endometrium, intestine, two in nervous system, and one HGMD- deletion. The specific cellular location of IDO is in cytosol, smooth muscle contractile fibers and stereocilium bundle. The expression specificity shows that IDO is present very widely in all cell types but there is an elevation of expression in placenta, pancreas, pancreas islets, including dendritic cells (DCs) according to gene atlas of transcriptome (9). Expression of IDO is common in antigen presenting cells (APCs), monocytes (MO), macrophages (MQs), DCs, T-cells, and some B-cells. IDO present in APCs (10; 11), due to magnitude of role play hierarchy and level of expression DCs are the better choice but including MOs during establishment of three DC cell subset, CD14+CD25+, CD14++CD25+ and CD14+CD25++ may increase the longevity and efficacy of the interventions. IDO is strictly regulated and confined to immune system with diverse functions based on either positive or negative stimulations. The positive stimulations are T cell tolerance induction, apoptotic process, and chronic inflammatory response, type 2 immune response, interleukin-12 production (12). The negative stimulations are interleukin-10 production, activated T cell proliferation, T cell apoptotic process. Furthermore, there are more functions allocating fetus during female pregnancy; changing behavior, responding to lipopolysaccharide or multicellular organismal response to stress possible due to degradation of tryptophan, kynurenic acid biosynthetic process, cellular nitrogen compound metabolic process, small molecule metabolic process, producing kynurenine process (13; 14; 15). IDO plays a role in a variety of pathophysiological processes such as antimicrobial and antitumor defense, neuropathology, immunoregulation, and antioxidant activity (16; 17; 18; 19). A: Structure of human IDO2 gene and transcripts. Complete coding region is 1260 bps encoding a 420 aa polypeptide. Alternate splice isoforms lacking the exons indicated are noted. 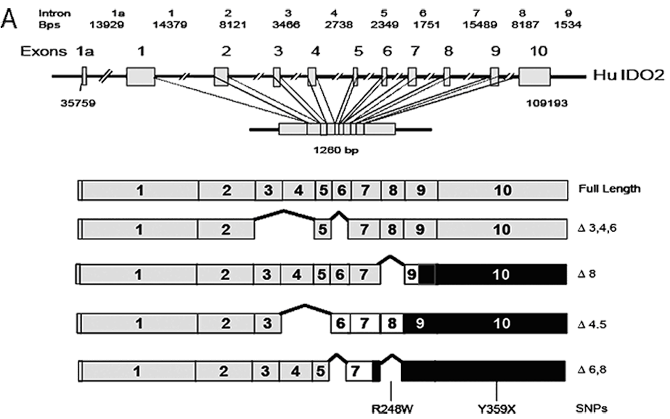 Hatch boxes represent a frameshift in the coding region to an alternate reading frame leading to termination. Black boxes represent 3′ untranslated regions. Nucleotide numbers, intron sizes, and positioning are based on IDO sequence files NW_923907.1 and GI:89028628 in the Genbank database. Molecular genetics data from earlier findings based on reporter assay results showed that IDO promoter is regulated by ISRE-like elements and GAS-sequence at -1126 and -1083 region (20). Two cis-acting elements are ISRE1 (interferon sequence response element 1) and interferon sequence response element 2 (ISRE2). Analyses of site directed and deletion mutation with transfected cells demonstrated that introduction of point mutations at these elements decreases the IDO expression. Removing ISRE1 decreases the effects of IFNgamma induction 50 fold and deleting ISRE1 at -1126 reduced by 25 fold (3). Introducing point mutations in conserved t residues at -1124 and -1122 (from T to C or G) in ISRE consensus sequence NAGtttCA/tntttNCC of IFNa/b inducible gene ISG4 eliminates the promoter activity by 24 fold (21). ISRE2 have two boxes, X box (-114/1104) and Y Box 9-144/-135), which are essential part of the IFNgamma response region of major histocompatibility complex class II promoters (22; 23). When these were removed from ISRE2 or introducing point mutations at two A residues of ISRE2 at -111 showed a sharp decrease after IFNgamma treatment by 4 fold (3). B: Amino acid alignment of IDO and IDO2. Amino acids determined by mutagenesis and the crystal structure of IDO that are critical for catalytic activity are positioned below the human IDO sequence. Two commonly occurring SNPs identified in the coding region of human IDO2 are shown above the sequence which alter a critical amino acid (R248W) or introduce a premature termination codon (Y359stop). IDO was originally discovered in 1967 in rabbit intestine (25). Later, in 1990 the human IDO gene is cloned and sequenced (7). However, its importance and relevance in immunology was not created until prevention of allocation of fetal rejection and founding expression in wide range of human cancers (26; 27). There are three types of IDO, pro-IDO like, IDO1, and IDO2. In addition, another enzyme called TDO, tryptophan 2, 3, dehydrogenase solely degrade L-Trp at first-rate limiting mechanism in liver and brain. IDO1 mechanism is the target for immunotherapy applications. The initial discovery of IDO in human physiology is protection of pregnancy (1) since lack of IDO results in premature recurrent abortion (28; 26; 29). The initial rate-limiting step of tryptophan metabolism is catalyzed by either IDO or tryptophan 2, 3-dioxygenase (TDO). Structural studies of IDO versus TDO presenting active site environments, conserved Arg 117 and Tyr113, found both in TDO and IDO for the Tyr-Glu motif, but His55 in TDO replaced by Ser167b in IDO (30; 2). As a result, they are regulated with different mechanisms (1; 2) (30). The short-lived TDO, about 2h, responds to level of tryptophan and its expression regulated by glucorticoids (31; 32). Thus, it is a useful target for regulation and induced by tryptophan so that increasing tryptophan induces NAD biosynthesis. Whereas, IDO is not activated by the level of Trp presence but inflammatory agents with its interferon stimulated response elements (ISRE1 and ISRE2) in its (33; 34; 35; 36; 3; 10) promoter. TDO promoter contains glucorticoid response elements (37; 38) and regulated by glucocorticoids and other available amino acids for gluconeogenesis. 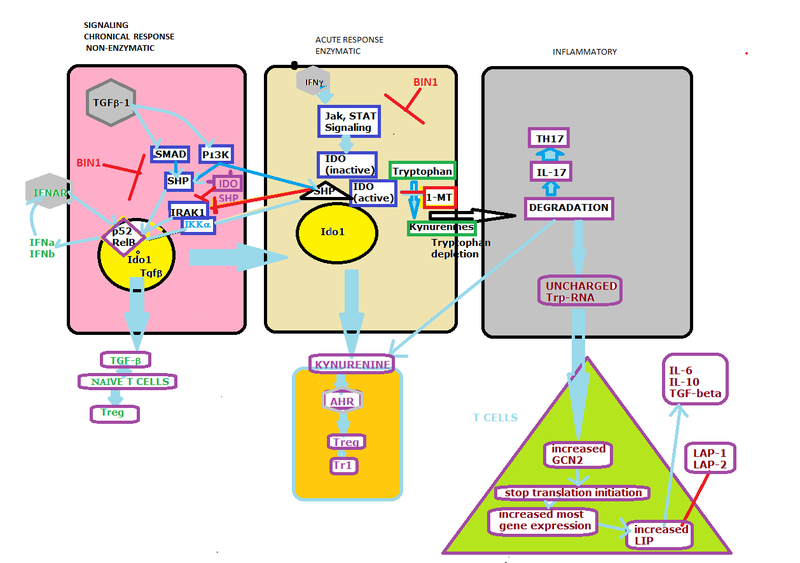 This is how IDO binds to only immune response cells and TDO relates to NAD biosynthesis mechanisms. Furthermore, TDO is express solely in liver and brain (36). NAD synthesis (39) showed increased IDO ubiquitous and TDO in liver and causing NAD level increase in rat with neuronal degeneration (40; 41). NAM has protective function in beta-cells could be used to cure Type1 diabetes (40; 42; 43). In addition, knowledge on NADH/NAD, Kyn/Trp or Trp/Kyn ratios as well as Th1/Th2, CD4/CD8 or Th17/Threg are equally important (44; 40). The third type of IDO, called IDO2 exists in lower vertebrates like chicken, fish and frogs (45) and in human with differential expression properties. The expression of IDO2 is only in DCs, unlike IDO1 expresses on both tumors and DCs in human tissues. Yet, in lower invertebrates IDO2 is not inhibited by general inhibitor of IDO, D-1-methyl-tryptophan (1MT) (46). Recently, two structurally unusual natural inhibitors of IDO molecules, EXIGUAMINES A and B, are synthesized (47). LIP mechanism cannot be switch back to activation after its induction in IDO2 (46). Crucial cancer progression can continue with production of IL6, IL10 and TGF-beta1 to help invasion and metastasis. Inclusion of two common SNPs affects the function of IDO2 in certain populations. SNP1 reduces 90% of IDO2 catalytic activity in 50% of European and Asian descent and SNP2 produce premature protein through inclusion of stop-codon in 25% of African descent lack functional IDO2 (Uniport). Knowing the evolutionary steps will helps us to identify how we can manage the regulator function to protect human health in cancer, immune disorders, diabetes, and infectious diseases. Bacterial IDO has two types of IDOs that are group I and group II IDO (48). These are the earliest version of the IDO, pro-IDO like, proteins with a quite complicated function. Each microorganism recognized by a specific set of receptors, called Toll-Like Receptors (TLR), to activate the IDO-like protein expression based on the origin of the bacteria or virus (49; 35). Thus, the genesis of human IDO originates from gene duplication of these early bacterial versions of IDO-like proteins after their invasion interactions with human host. IDO1 only exists in mammals and fungi. Fungi also has three types of IDO; IDOa, IDO beta, and IDO gamma (50) with different properties than human IDOs, perhaps multiple IDO is necessary for the world’s decomposers. All globins, haemoglobins and myoglobins are destined to evolve from a common ancestor, which is only 14-16kDa (51) length. Binding of a heme and being oxygen carrier are central to the enzyme mechanism of this family. Globins are classified under three distinct origins; a universal globin, a compact globin, and IDO-like globin (52). IDO like globin widely distributed among gastropodic mollusks (53; 51). The indoleamine 2, 3-dioxygenase 1–like “myoglobin” (Myb) was discovered in 1989 in the buccal mass of the abalone Sulculus diversicolor (54). The conserved region between Myb and IDO-like Myb existed for at least 600 million years (53). Even though the splice junction of seven introns was kept intact, the overall homolog region between Myb and IDO is only about 35%. No significant evolutionary relationship is found between them after their amino acid sequence of each exon is compared to usual globin sequences. This led the hint that molluscan IDO-like protein must have other functions besides carrying oxygen, like myoglobin. Alignment of S. cerevisiae cDNA, mollusk and vertebrate IDO–like globins show the key regions for controlling IDO or myoglobin function (55). These data suggest that there is an alternative pathways of myoglobin evolution. In addition, understanding the diversity of globin may help to design better protocols for interventions of diseases. 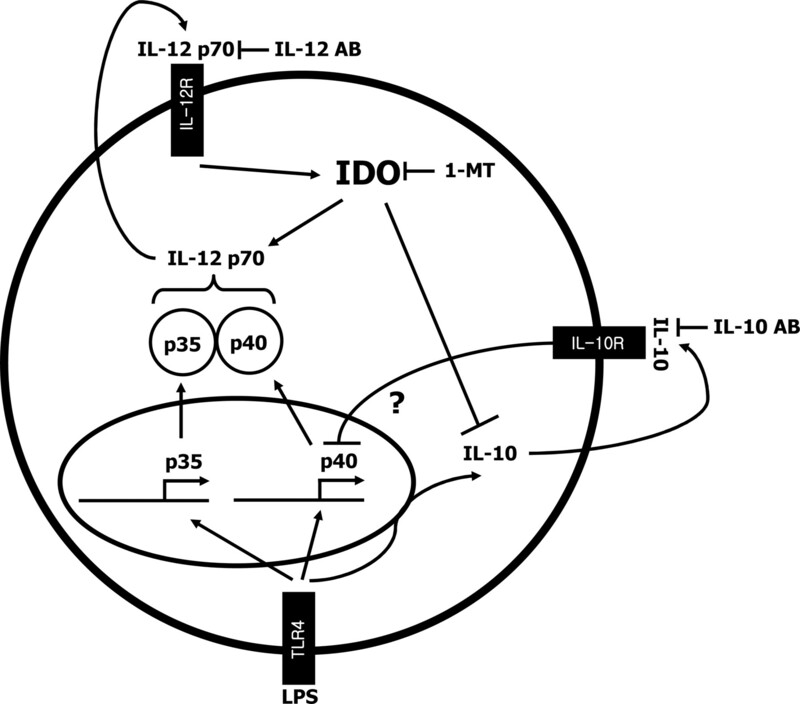 The dichotomy of IDO mechanism lead the discovery that IDO is more than an enzyme as a versatile regulator of innate and adaptive immune responses in DCs (66; 67; 68). Meantime IDO also involve with Th2 response and B cell mediated autoimmunity showing that it has three paths, short term (acute) based on enzymatic actions, long term (chronic) based on non-enzymatic role, and moonlighting relies of downstream metabolites of tryptophan metabolism (69; 70). IFNgamma produced by DC, MQ, NK, NKT, CD4+ T cells and CD8+ T cells, after stimulation with IL12 and IL8. Inflammatory cytokine(s) expressed by DCs produce IFNgamma to stimulate IDO’s enzymatic reactions in acute response. Then, TDO in liver and tryptophan catabolites act through Aryl hydrocarbon receptor induction for prevention of T cell proliferation. This mechanism is common among IDO, IDO2 (expresses in brain and liver) and TDO expresses in liver) provide an acute response for an innate immunity (30). When the pDCs are stimulated with IFNgamma, activation of IDO is go through Jak, STAT signaling pathway to degrade Trp to Kyn causing Trp depletion. The starvation of tryptophan in microenvironment inhibits generation of T cells by un-read t-RNAs and induce apoptosis through myc pathway. In sum, lack of tryptophan halts T cell proliferation and put the T cells in apoptosis at S1 phase of cell division (71; 62). The intermediary enzymes, functioning during Tryptophan degradation in Kynurenine (Kyn) pathway like kynurenine 3-hydroxylase and kynureninase, are also induced after stimulation with liposaccaride and proinflammatory cytokines (72). They exhibit their function in homeostasis through aryl-hydrocarbon receptor (AhR) induction by kynurenine as an endogenous signal (73; 74). The endogenous tumor-promoting ligand of AhR are usually activated by environmental stress or xenobiotic toxic chemicals in several cellular processes like tumorigenesis, inflammation, transformation, and embryogenesis (Opitz ET. Al, 2011). Human tumor cells constitutively produce TDO also contributes to production of Kyn as an endogenous ligand of the AhR (75; 27). Degradation of tryptophan by IDO1/2 in tumors and tumor-draining lymph nodes occur. As a result, there are animal studies and Phase I/II clinical trials to inhibit the IDO1/2 to prevent cancer and poor prognosis (NewLink Genetics Corp. NCT00739609, 2007). Systemic inflammation (like in sepsis, cerebral malaria and brain tumor) creates hypotension and IDO expression has the central role on vascular tone control (63). Moreover, inflammation activates the endothelial coagulation activation system causing coagulopathies on patients. This reaction is namely endothelial cell activation of IDO by IFNgamma inducing Trp to Kyn conversion. After infection with malaria the blood vessel tone has decreases, inflammation induce IDO expression in endothelial cells producing Kyn causing decreased trp, lower arterial relaxation, and develop hypotension (Wang, Y. et. al 2010). Furthermore, existing hypotension in knock out Ido mice point out a secondary mechanism driven by Kyn as an endogenous ligand to activate non-canonical NfKB pathway (63). Another study also hints this “back –up” mechanism by a significant outcome with a differential response in pDCs against IMT treatment. 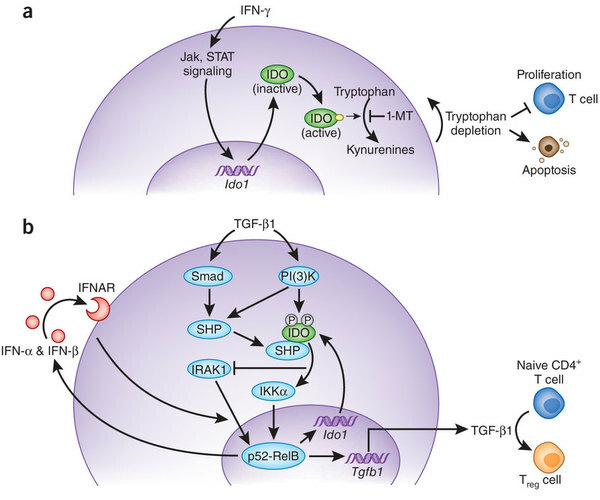 Unlike IFN gamma conditioned pDC blocks T cell proliferation and apoptosis, methyl tryptophan fails to inhibit IDO activity for activating naïve T cells to make Tregs at TGF-b1 conditioned pDCs (77; 78). The second role of the IDO relies on non-enzymatic action as being a signal molecule. Yet, IDO2 and TDO are devoid of this function. This role mainly for maintenance of microenvironment condition. DCs response to TGFbeta-1 exposure starts the kinase Fyn induce phosphorylation of IDO-associated immunoreceptor tyrosine–based inhibitory motifs (ITIMs) for propagation of the downstream signals involving non-canonical (anti-inflammatory) NF-kB pathway for a long term response. When the pDCs are conditioned with TGF-beta1 the signaling (68; 77; 78) Phospho Inositol Kinase3 (PIK-3)-dependent and Smad independent pathways (79; 80; 81; 82; 83) induce Fyn-dependent phosphorylation of IDO ITIMs. A prototypic ITIM has the I/V/L/SxYxxL/V/F sequence (84), where x in place of an amino acid and Y is phosphorylation sites of tyrosines (85; 86). Smad independent pathway stimulates SHP and PIK3 induce both SHP and IDO phosphorylation. Then, formed SHP-IDO complex can induce non-canonical (non-inflammatory) NF-kB pathway (64; 79; 80; 82) by phosphorylation of kinase IKKa to induce nuclear translocation of p52-Relb towards their targets. Furthermore, the SHP-IDO complex also may inhibit IRAK1 (68). SHP-IDO complex activates genes through Nf-KB for production of Ido1 and Tgfb1 genes and secretion of IFNalpha/IFNbeta. IFNa/IFNb establishes a second short positive feedback loop towards p52-RelB for continuous gene expression of IDO, TGFb1, IFNa and IFNb (87; 68). However, SHP-IDO inhibited IRAK1 also activates p52-RelB. Nf-KB induction at three path, one main and two positive feedback loops, is also critical. Finally, based on TGF-beta1 induction (76) cellular differentiation occurs to stimulate naïve CD4+ T cell differentiation to regulatory T cells (Tregs). In sum, TGF-b1 and IFNalpha/IFNbeta stimulate pDCs to keep inducing naïve T cells for generation of Treg cells at various stages, initiate, maintain, differentiate, infect, amplify, during long-term immune responses (67; 66). Moonlighting function of Kyn/AhR is an adaptation mechanism after the catalytic (enzymatic) role of IDO depletes tryptophan and produce high concentration of Kyn induce Treg and Tr1 cell expansion leading Tregs to use TGFbeta for maintaining this environment (67; 76). In this role, Kyn pathway has positive-feedback-loop function to induce IDO expression. In T cells, tryptophan starvation induces Gcn2-dependent stress signaling pathway, which initiates uncharged Trp-tRNA binding onto ribosomes. Elevated GCN2 expression stimulates elF2alfa phosphorylation to stop translation initiation (88). Therefore, most genes downregulated and LIP, an alternatively initiated isoform of the b/ZIP transcription factor NF-IL6/CEBP-beta (89). This mechanism happens in tumor cells based on Prendergast group observations. As a result, not only IDO1 propagates itself while producing IFNalpha/IFNbeta, but also demonstrates homeostasis choosing between immunegenity by production of TH17or tolerance by Tregs. This mechanism acts like a see-saw. Yet, tolerance also can be broken by IL6 induction so reversal mechanism by SOC-3 dependent proteosomal degradation of the enzyme (90). All proper responses require functional peripheral DCs to generate mature DCs for T cells to avoid autoimmunity (91). Niacin (vitamin B3) is the final product of tryptophan catabolism and first molecule at Nicotinomic acid (NDA) Biosynthesis. The function of IDO in tryptophan and NDA metabolism has a great importance to develop new clinical applications (40; 42; 41). NAD+, biosynthesis and tryptophan metabolisms regulate several steps that can be utilize pharmacologically for reformation of healthy physiology (40). The mechanism of microbial response and infectious tolerance are complex and the origination of IDO based on duplication of microbial IDO (49). During microbial responses, Toll-like receptors (TLRs) play a role to differentiate and determine the microbial structures as a ligand to initiate production of cytokines and pro-inflammatory agents to activate specific T helper cells (92; 93; 94; 95). Uniqueness of TLR comes from four major characteristics of each individual TLR by ligand specificity, signal transduction pathways, expression profiles and cellular localization (96). Thus, TLRs are important part of the immune response signaling mechanism to initiate and design adoptive responses from innate (naïve) immune system to defend the host. TLRs are expressed cell type specific patterns and present themselves on APCs (DCs, MQs, monocytes) with a rich expression levels (96; 97; 98; 99; 93; 100; 101; 102; 87). Induction signals originate from microbial stimuli for the genesis of mature immune response cells. Co-stimulation mechanisms stimulate immature DCs to travel from lymphoid organs to blood stream for proliferation of specific T cells (96). After the induction of iDCs by microbial stimuli, they produce proinflammatory cytokines such as TNF and IL-12, which can activate differentiation of T cells into T helper cell, type one (Th1) cells. (103). Utilizing specific TLR stimulation to link between innate and acquired responses can be possible through simple recognition of pathogen-associated molecular patterns (PAMPs) or co-stimulation of PAMPs with other TLR or non-TLR receptors, or even better with proinflammatory cytokines. Some examples of ligand- TLR specificity shown in Table1, which are bacterial lipopeptides, Pam3Cys through TLR2 (92; 104; 105). Double stranded (ds) RNAs through TLR3 (106; 107), Lipopolysaccharide (LPS) through TLR4, bacterial flagellin through TLR5 (108; 109), single stranded RNAs through TLR7/8 (97; 98), synthetic anti-viral compounds imiquinod through TLR 7 and resiquimod through TLR8, unmethylated CpG DNA motifs through TLR9 (Krieg, 2000). Then, the specificity is established by correct pairing of a TLR with its proinflammatory cytokines, so that these permutations influence creation and maintenance of cell differentiation. For example, leading the T cell response toward a preferred Th1 or Th2 response possible if the cytokines TLR-2 mediated signals induce a Th2 profile when combined with IL-2 but TLR4 mediated signals lean towards Th1 if it is combined with IL-10 or Il-12, (110; 111) (112). Lipopolysaccharide, LPS TLR4 (96). (112). Furthermore, if the DCs are stimulated with IL-6, DCs relieve the suppression of effector T cells by regulatory T cells (113). The modification of IDO+ monocytes manage towards specific subset of T cell activation with specific TLRs are significantly important (94). The type of cell with correct TLR and stimuli improves or decreases the effectiveness of stimuli. Induction of IDO in monocytes by synthetic viral RNAs (isRNA) and CMV was possible, but not in monocyte derived DCs or TLR2 ligand lipopeptide Pam3Cys since single- stranded RNA ligands target TLR7/8 in monocytes derive DCs only (Lee J, 2003). These data show that TLRs has ligand specificity, signal transduction pathways, expression profiles and cellular localization so design of experiments should follow these rules. Overall our purpose of this information is to find a method to manipulate IDO to correct/fix/modulate immune responses for clinical applications. This first part of the review concerns the basic science information gained overall several years that lay the foundation that translational research scientist should familiar to develop a new technology for clinic. The first connection of IDO and human health came from a very natural event that is protection of pregnancy in human. The focus of the translational medicine is treatment of cancer or prevention/delay cancer by stem cell based Dendritic Cell Vaccine (DCvax) development. 1. Biochemistry of tryptophan in health and disease. BenderDA. 1983, Mol Aspects Med , pp. 6:101–197. 2. 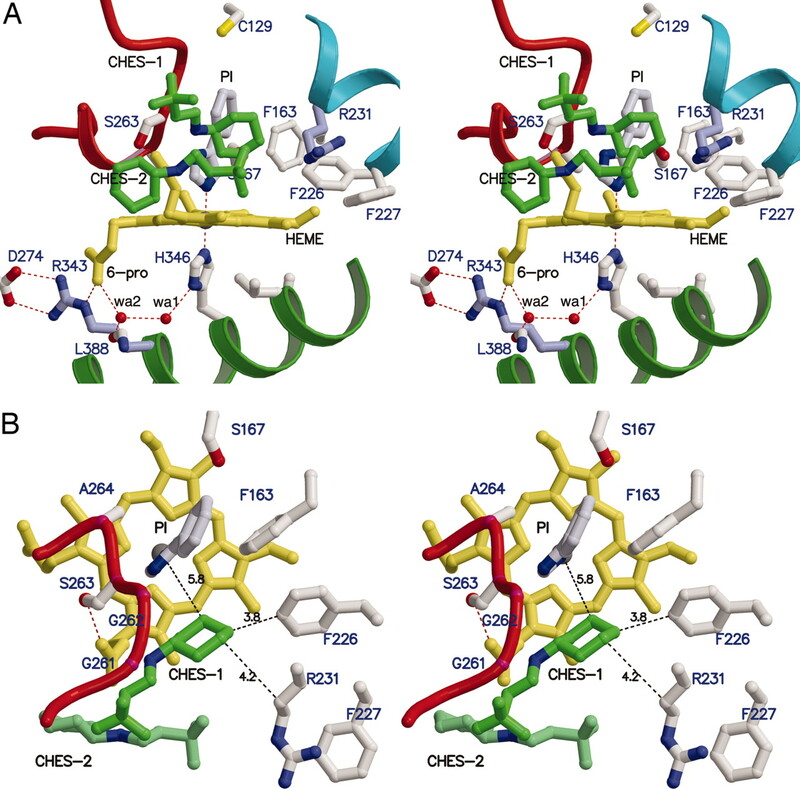 Molecular insights into substrate recognition and catalysis by indolamine 2,3-dioxygenase. Forouhar, F., Anderson, R., Mowat, C.F, et al. 2006, PNAS, pp. vol. 104, no:2, 473-478. 3. Importance of the Two Interferon-stimulated Response Element. Konan KV, Taylor, MW. 1996, J. Biol. Chem.-, pp. 19140-5. 4. induction of indolamine 2,3 dioxygenase: A mechanism of the anti-tumor activity of interferon gamma. Ozaki, Y., Edelstein, M.P., Duch, D.S. 1998, PNAS USA., pp. vol:85, 1242-1246. 5. Localization of the human indoleamine 2,3-dioxygenase (IDO) gene to the pericentromeric region of human chromosome 8. . Burkin, D. J., Kimbro, K. S., Barr, B. L., Jones, C., Taylor, M. W., Gupta, S. L. 1993, Genomics , pp. 17: 262-263. 6. Localization of indoleamine 2,3-dioxygenase gene (INDO) to chromosome 8p12-p11 by fluorescent in situ hybridization. Najfeld, V., Menninger, J., Muhleman, D., Comings, D. E., Gupta, S. L. 1993, Cytogenet. Cell Genet. , pp. 64: 231-232. 7. Molecular cloning, sequencing and expression of human interferon-gamma-inducible indoleamine 2,3-dioxygenase cDNA. . Dai, W., Gupta, S. L. 1990, Biochem. Biophys. Res. Commun. , pp. 168: 1-8. 8. Gene structure of human indoleamine 2,3-dioxygenase. Kadoya, A., Tone, S., Maeda, H., Minatogawa, Y., Kido, R. 1992, Biochem. Biophys. Res. Commun. , pp. 189: 530-536. 9. A gene atlas of th emouse and human protein-encoding transcriptomes. Andrew I. Su, Tim Wiltshire, Serge Batalov , Hilmar Lapp , Keith A. Ching , David Block, Jie Zhang , Richard Soden , Mimi Hayakawa , Gabriel Kreiman , Michael P. Cooke , John R. Walker , and John B. Hogenesch. 2004, PNAS, pp. vol. 101, no. 166062-6067 (10.1073/pnas.0400782101). 10. Indoleamine 2,3-dioxygenase production by human dendritic cells results in the inhibition of T cell proliferation. Hwu P, Du MX, Lapointe R, Do M, Taylor MW, Young HA. 2000, J. Immunol, pp. 164:3596–3599. 11. Inhibition of T cell proliferation by acrophage tryptophan catabolism. Munn, D.H. et al. 1999, J. Exp. Med., p. 189:1363. 12. HeLa cells cocultured with peripheral blood lymphocytes acquire an immuno-inhibitory phenotype through up-regulation of indoleamine 2,3-dioxygenase activity. Logan, G. J., Smyth, C. M. F., Earl, J. W., Zaikina, I., Rowe, P. B., Smythe, J. A., Alexander, I. E. 2002, Immunology, pp. 105:478-487. 13. Indoleamine 2,3-Dioxygenase – Is It an Immun Suppressor? Soliman H, Mediaville-Varela M, Antonia S. 2010, Cancer J. , pp. 16:354-359. 14. Targeting the immunoregulatory indoleamine 2,3-dioxygenase pathway in immunotherapy. Johnson BA, III, Baban B, Mellor AL. 2009, Immunotherapy. , pp. 645–661. 15. Indoleamine 2,3-dioxygenase and regulation of T cell immunity. AL., Mellor. 2005, Biochem Biophys Res Commun. , pp. 338(1):20–24. 16. Fallarino, F., Grohmann, U., Hwang, K. W., Orabona, C., Vacca, C., Bianchi, R., Belladonna, M. L., Fioretti, M. C.Modulation of tryptophan catabolism by regulatory T cells. Fallarino, F., Grohmann, U., Hwang, K. W., Orabona, C., Vacca, C., Bianchi, R., Belladonna, M. L., Fioretti, M. C., Alegre, M.-L., Puccetti, P. 2003, Nature Immun., pp. 4: 1206-1212. 17. CTLA-4-Ig regulates tryptophan catabolism in vivo. Grohmann, U., Orabona, C., Fallarino, F., Vacca, C., Calcinaro, F., Falorni, A., Candeloro, P., Belladonna, M. L., Bianchi, R., Fioretti, M. C., Puccetti, P. 2002, Nature Immun. , pp. 3: 1097-1101. 18. Reverse signaling through GITR ligand enables dexamethasone to activate IDO in allergy. Grohmann, U., Volpi, C., Fallarino, F., Bozza, S., Bianchi, R., Vacca, C., Orabona, C., Belladonna, M. L., Ayroldi, E., Nocentini, G., Boon, L., Bistoni, F., Fioretti, M. C., Romani, L., Riccardi, C., Puccetti, P. 2007, Nature Med., pp. 13:579-586. 19. Cells expressing indoleamine 2,3-dioxygenase inhibit T cell responses. Mellor, A. L., Keskin, D. B., Johnson, T., Chandler, P., Munn, D. H. 2002, J. Immun. , pp. 168: 3771-3776. 20. Chon, SY, Hassanain, HH, Piine, R., and Gupta, SL. 1995, J. Interferon Cytokine Res. , pp. 15, 517-526. 21. Levy, ED, KEsler, DS, Pine, R., Reich, N, and Darnell, JE.Jr et al. 1988, Genes Dev, pp. 2,383-393. 22. Benoist, C. and Manthis, D. 1990, Annu. Rev of Immunol., pp. 8, 681-715. 23. Dorn, A, Durand, B., Marling, C., Meur, M.L., Beoist, C., and Mathis, D. 1987, PNAS USA, pp. 34, 6249-6253. 24. Konan, K.V. Ph.D. Thesis. Transcriptional Regulation of the Indolamine 2,3-oxygenase Gene. s.l. : Indiana University, Bloominigton, 1995. 25. Tryptophan pyrrolase of rabbit intestine: D- and L–tryptophan cleaving enzyme or enzymes. Yamamoto, S., and Hayashi, O. 1967, J Biol Chem, pp. 242: 5260-5266. 26. Prevention of allogeneic fetal rejection by tryptophan catabolism. Munn, DH, Zhou M, Attwood JT, Bondarev I, Conway SJ, Marshall B, Brown C, Mellor AL. 1998, Science, pp. 281:1191–3. 27. Evidence for a tumoral immune resistance mechanismbased on tryptophan degradation by indoleamine 2,3-dioxygenase. Uyttenhove, C. et al. 2003, Nature Med. 9,, pp. 1269–1274 . 28. Pregnancy: success and failure within the Th1/Th2/Th3 paradigm. Raghupathy, R. 2001., Seminars in Immunology, pp. Volume 13, Issue 4, Pages 219–227. 29. Why is the fetal allograft not rejected? Davies, C. J. March 2007 , J ANIM SCI , pp. vol. 85 no. 13 suppl E32-E35 . 30. Exploring the mechanism of tryptoophan 2,3-dioxygenase. Thackray, S., Mowat, C.G., Chapman, K. 2008, Biochem. Society Transaction., pp. 36, 1120-1123. 31. The new life of a centenarian: signalling functions of NAD(P). Berger F, Ramírez-Hernández MH, Ziegler M. 2004, Trends Biochem Sci , pp. 29:111–118 . 32. Biochemistry of tryptophan in health and disease. DA, Bender. 1983, Mol Aspects Med, pp. 6:101–197. 33. Poliovirus induces indoleamine-2,3-dioxygenase and quinolinic acid synthesis in macaque brain. Heyes MP, Saito K, Jacobowitz D, Markey SP, Takikawa O, Vickers JH. 1992, FASEB J., pp. 6:2977–2989. 34. Sanni LA, Thomas SR, Tattam BN, Moore DE, Chaudhri G, Stocker R, Hunt NH 1998Dramatic changes in oxidative tryptophan metabolism along the kynurenine pathway in experimental cerebral and noncerebral malaria. . Sanni LA, Thomas SR, Tattam BN, Moore DE, Chaudhri G, Stocker R, Hunt NH. 1998, Am J Pathol, pp. 152:611–619. 35. Induction of pulmonary indoleamine 2,3-dioxygenase by intraperitoneal injection of bacterial lipopolysaccharide. . Yoshida R, Hayaishi O. 1978, Proc Natl Acad Sci USA , pp. 75:3998–4000. 36. Induction of indoleamine 2,3-dioxygenase in mouse lung during virus infection. . Yoshida R, Urade Y, Tokuda M, Hayaishi O. 1979, Proc Natl Acad Sci USA , pp. 76:4084–4086. 37. Induction of pulmonary indoleamine 2,3-dioxygenase by intraperitoneal injection of bacterial lipopolysaccharide. Yoshida R, Hayaishi. 1978, PNAS USA, pp. 3998-4000. 38. Sequence of human 2,3-dioxygenase (TDO2): presence of a glucorticoid response-like element composed of a GTT repeat and intronic CCCCT repeat. Comings DE, Muhleman D, Dietz G, Sherman M, Forest. 1995, Genomics, pp. 29:390-396165. 39. Studies on the biosynthesis of Nicotinamide adenine inucleotide. II.Arole of picolinic carboxylase in the Biosynthesisofnicotinamideadeninedinucleotidefromtryptophan in mammals. Ikeda M, Tsuji H, Nakamura S, Ichiyama A, Nishizuka Y, HayaishiO. 1965, J. Biol. Chem. , pp. 240: 1395-1401. 40. The Secret Life of NAD+: An Old Metabolite Controlling New Metabolic Signaling Pathways. Houtkooper R.H., Carles Cantó C. , Wanders, R.J. and Auwerx, J. 2010, Endocrine Reviews , pp. vol. 31 no. 2 194-223, doi: 10.1210/er.2009-0026. 41. Stimulation of Nicotinamide adenine dinucleotide biosynthetic pathways delays axonal degeneration after axotomy. Sasaki Y, Araki T, Milbrandt J. 2006, J Neurosci , pp. 26: 8484–8491. 42. European Nicotinamide Diabetes Intervention Trial (ENDIT): a randomised controlled trial of intervention before the onset of type 1 diabetes. Gale EA, Bingley PJ, Emmett CL, CollierT. 2004, Lancet., pp. 363:925–931. 43. Safety of high-dose nicotinamide: a review. Knip M, Douek IF, Moore WP, Gillmor HA, McLean AE, Bingley PJ, Gale EA. 2000, Diabetologia, pp. 43:1337–1345. 44. Large supplements of nicotinic acid and nicotinamide increase tissue NAD and poly(ADP-ribose) levels but do not affect diethylnitrosamine-induced altered hepatic foci in Fischer-344 rats. JacksonTM, Rawling JM, Roebuck BD, Kirkland JB. 1995, J Nutr , p. 125:1455. 45. 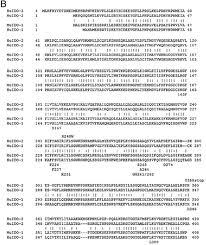 Characterization and evolution of vertebrate indelamine 2,3-dihydrogenases IDOs from monotremes and marsupials. Yuasa, HJ, Ball, HJ, Ho, YF, Austin, CJ, et al. 2009, Comp. Biochem. Physiol. B. Biochem.. Mol. Biol., pp. 153 (2): 137-144. 46. Novel tryptophan catabolic enzyme IDO2 is the preferred biochemical target of the antitumor indolamine 2,3-dihydrogenase inhibitor compound D-1 methyl-tryptophan. Metz, R., Duhadaway, JB, Kamasani, U, Laury-Kleintop, L., Muller, AJ, Prendergast, GC. 2007, Cancer Res., pp. 67 (15): 7082-7087. 47. Total synthesis of exiguamines A and B inspired by catechollamine chemistry. Sofiyev, V, Lumb, JP, Volgraf, M., Trauner, D. 2012, Chemistry., pp. 18 (16): 4999-5005. 48. Molecular evolution of bacterial indolamine 2,3-dioxygenase. Yuasa, H J, Ushigoe, A, Ball, HJ. 2011, Gene., pp. 484 (1) : 22-31. 49. Infectious tolerance and the long-term acceptance of transplant tissue. Waldman, H., Adams, E., Fairchild, P., and Cobbold, S. 2006, J. Immunol., pp. 212:301-313. 50. Molecular evolution and characterizationof fungal indolamine 2,3-dioxygenases. Yuasa, HJ and Ball, HJ. 2012, J. Mol. Eval., pp. 72 (2): 160-168. 51. convergent evolution. The gene structure of Sulculus 41 kDa myoglobin is homologous with tht of human indolamine dioxygenase. Suzuki, T, Imai, K. 1996, Biochim. Biophys. Acta., pp. 1308(1):41-48. 52. Evolutionof myoglobin. Suzuki, T., Imai, K. 1998, Cell Mol Life Sci, pp. 54(9):979-1004. 53. A myoglobin evolved from indolamine 2,3-dioxygenase, trtptophan-degrading enzyme. Suzuki, T., Kawamichi, H., Imai, K. 1998, Comp Biochem Phisiol. Mol. Biol., pp. 121(2):117-128. 54. Do molluscs possess indolamine 2,3-dioxygenase? Yuasa, HJ and Suzuki, T. 2005, Comp. Biochem. Physiol. B. Biochem. Mol. Biol. , pp. (3) 445-454. 55. Comparison studies of the indolamine dioxygenase-like myoglobin from the abalone Sulculus diversicolor. Suzuki, T., Imai, K. 1997, Comp. Biohem. Phsiol B Biochem Mol Biol, pp. 117 (4)599-604. 56. 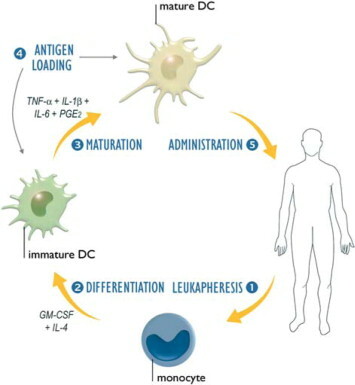 Orchestration of the immune response by dendritic cells. Buckwalter MR, Albert ML. 2009, Curr Biol., pp. 19(9):355–361. 57. Dendritic cells and the control of immunity. Banchereau J, Steinman RM. 1998, Nature., pp. 245–52. 58. IDO expression by dendritic cells: tolerance and tryptophan catabolism. . Munn DH, Mellor AL. 2004, Nat Rev Immunol. , pp. 762–74. 59. Monocyte and Macrophage. Gordon, S. and Taylor, P.R. 2005, NATURE REVIEWS | IMMUNOLOGY , pp. vol:5, 953-964. 60. Blood monocytes consist of two principal subsets with distinct migratory properties. Geissmann F, Jung S, Littman DR. 2003, Immunity. , pp. 19:71–82. 61. Identification of a novel cell type in peripheral lymphoid organs of mice. I Morphology, quantitation, tissue distribution. . Steinman RM, Cohn ZA. 1973, J Exp Med., pp. 137(5):1142–1162. 62. T cell apoptosis by tryptophan catabolism. Fallarino F, Grohmann U, Vacca C, Bianchi R, Orabona C, Spreca A, Fioretti MC, Puccetti P. 2002, Cell Death Differ , pp. 9:1069–1077. 63. 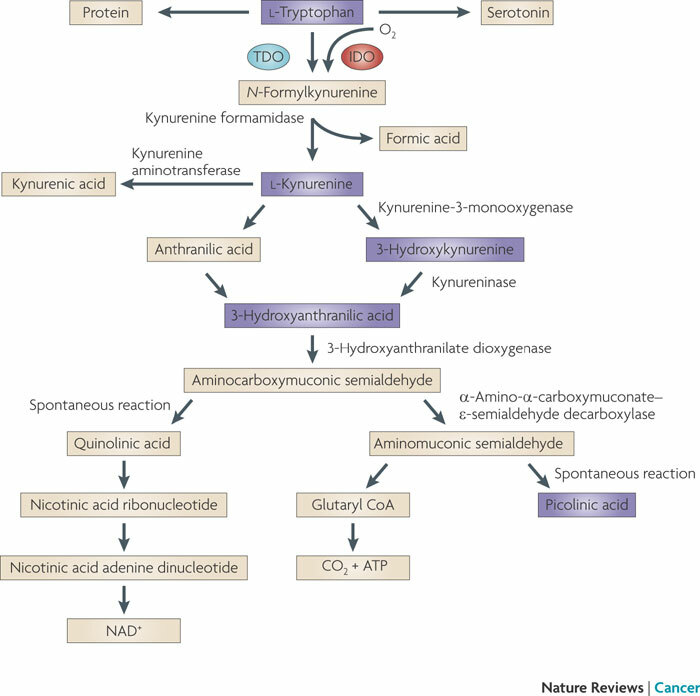 Kynurenine is a novel endothelium derived relaxing factor produced during inflammation. Wang, et al. 2010, Nat. Med., pp. 16(3): 279-285. 64. Activation of the noncanonical NF-kB pathway by HIV controls a Dendritic cell immunoregulatory phenotype. Manches, O. Fernandez, V.M.,, Plumas, J., Chaperot, L., and Bhardwaj, N. 2012, PNAS, pp. vol: 109, 14122-14127. 65. B cells inhibit induction of T cell-dependent tumor immunity. Qin, Z., Richter, G., Schuler, T., Ibe, S., Cao, X, Blakenstein, T. 1998, Nat. Med, p. 4:627. 66. Different partners, Opposite Outcmes: A new perspective of immunobiology of Indolamine 2,3 dioxygenase. Orabona, C., Pallotta, M.T., Grohman, U. 2012, Molecular Medicine., pp. 18:834-842. 67. Indolamine 2,3-dioxygenase: From catalyst to signaling function. Fallarino, F., Grohman, U., and Puccetti, P. 2012, Eurepean J. of Immunol. , pp. 42:1932-1937. 68. IDO: more than an enzyme. Chen, W. 2011, Nature Immonology, pp. 809-811. 69. Indolamine2,3-dehydrogenase in lung dendritic cells promotes Th2 responses and allergic inflammation. Xu, H., Oriss, T.B., Fei, M., Henry, A.C., Melgert, B.N., Chen, L., Mellor, A.L. 2008, PNAS USA, pp. 105: 6690-6695. 70. The immunoregulatory enzyme IDO paradoxically drives B-cellmediated autoimmunity. Scott, G.N., DuHadaway, J., Pigott, E., Ridge, N., Prendergast, G.C., Muller, A.J., Mandik-Nayak, L. 2009, J. Immunol., pp. 182:7509-7517. 71. Tryptophan deprivation sensitizes activated T cells to apoptosis prior to cell division. Lee GK, Park HJ, Macleod M, Chandler P, Munn DH, Mellor AL. 2002, Immunology , pp. 107:452–460. 72. Enzymology of NAD+ homeostasis in man. . Magni G, Amici A, Emanuelli M, Orsomando G, Raffaelli N, Ruggieri S. 2004, Cell Mol Life Sci , pp. 61:19–34. 73. Kynurenine pathway enzymes in dendritic cells initiate tolerogenesis in the absence of functional IDO. . Belladonna ML, Grohmann U, Guidetti P, Volpi C, Bianchi R, Fioretti MC, Schwarcz R, Fallarino F, Puccetti P. 2006, J Immunol. , pp. ;177:130–7. 74. An indogenous tumour promoting ligand of the human aryl hydrocarbon receptor. Opitz, et. al. 2011, pp. doi: 10.1038/nature10491,. 75. Inhibition of indoleamine 2,3-dioxygenase, animmunoregulatorytarget of the cancer suppression gene Bin1, potentiates cancer chemotherapy. Muller, A. J. et al. 2005, Nature Med. , pp. 11, 312–319 . 76. TGF-b; a master of all T cell trades. Li, M.O., Fravell, R.A. 2008, Cell. , pp. 134: 392-404. 77. Palotta, M.T. et al. 2011, Nat. Immunol., pp. 12:870-878. 78. Chen, W. et al. 2003, J. Exp. Immunol., p. 198: 1875. 79. Smads: transcriptional activators of TGF-beta responses. . Derynck R, Zhang Y, Feng XH. 1998, Cell , pp. 95 (6): 737–40. doi:10.1016/S0092-8674(00)81696-7.PMID 9865691. .
80. Smad transcription factors. Massagué J, Seoane J, Wotton D. 2005, Genes Dev, pp. 19 (23): 2783–810. doi:10.1101/gad.1350705. PMID . 81. A structural basis for mutational inactivation of the tumour suppressor Smad4. Shi Y, Hata A, Lo RS, Massagué J, Pavletich NP. 1997, Nature., pp. 388 (6637): 87–93.doi:10.1038/40431. PMID 9214508. 82. Promoting bone morphogenetic protein signaling through negative regulation of inhibitory Smads. Itoh F, Asao H, Sugamura K, Heldin CH, ten Dijke P, Itoh S. 2001, EMBO J., pp. 20 (15): 4132– doi:10.1093/emboj/20.15.4132. PMC 149146. PMID 11483516. 83. SMAD_Signaling_Network. http://www.sabiosciences.com. [Online] 2013. http://www.sabiosciences.com/pathway.php?sn=SMAD_Signaling_Network. 84. Immune inhibitory receptors. Revetch, J.V., and Lanier, L.L. 2000, Science., pp. 290:84-89. 85. Soc3 drives proteasomal degradation of indolamine 2,3-dioxygenase (IDO) and antagonizes IDO-dependent tolerogenesis. Orabona, C., Pallotta, M., Volpi, C., et al. 2008, PNAS USA, pp. 105: 20828-20833. 86. Cutting edge; silencing supressor of cytokine signaling3 expression in dendritic cells turns CD28-Ig from immune adjuvant to supressant. Orabona, C.,, Belladonna, M.L., et all. 2005, J. Immunol., pp. 174: 6582-6586. 87. Molecular signatures of T-cell inhibition in HIV-1 infection. Larsson, M., Shankar. E.M, Che, K.F., Ellegard, R., Barathan, M., Velu, V., and Kamarulzaman, A. 2013, Retrovirology, p. 10:31. 88. TGF-beta and CD4+CD25+ regulatory cells. Huber, S. and Schramn, C. 2006, Front. Bioscie., pp. 11:1014-1023. 89. Immune Escape as a fundemental trait of cancer; focus on IDO. Prendergast, G.C. 2008, Oncogene., pp. 27, 3889-3900. 90. Il-6 inhibits the tolerogenic functionof CD8+ dendritic cells expressing indolamine 2,3-dioxygenase. Grohman, U., Fallarino, F., et al. 2001, J. Immunol., pp. 167:708-714. 91. Avoiding horror autotoxicus: Th eimportance of dentritic cells in peripheral T cell tolerance. Steinman, R.M., and Nussenzweig, M.C. 2002, PNAS, pp. no:1, 351-358. 92. Dendritic-cell function in Toll-like receptor- and MyD88-knockout mice . Kaisho, T., Akira, S. 2001, Trends Immunol , pp. 22,78-83. 93. Innate sensing of self and non-self RNAs by Toll-like receptors. Sioud, M. 2006., Trends Mol Med., pp. 12:67–76. 94. Impaired expression of indoleamine 2, 3-dioxygenase in monocyte-derived dendritic cells in response to Toll-like receptor-7/8 ligands. Furset, G., Fløisand, Y. and Sioud, M. 2008, Immunology., pp. 123(2): 263–271, doi: 10.1111/j.1365-2567.2007.02695.x. 95. Toll-;ike receptor 9 mediated induction of the immunorepressor pathway of tryptophan metabolism. Fallarino, F., and Puccetti, P. 2006, Eur. J. of Imm., pp. 36:8-11. 96. Toll-like receptors and host defense against microbial pathogens: bringing specificity to the innate immune system. . Netea MG, der Graaf C, Van der Meer JWM, Kullberg BJ. 2004, J Leukoc Biol. , pp. 75:749–55. 97. Species-specific recognition of single-stranded RNA via toll-like receptor 7 and 8. . Heil F, Hemmi H, Hochrein H, et al. 2004, Science. , pp. 303:1526–9. 98. Innate antiviral responses by means of TLR7-mediated recognition of single-stranded RNA. . Diebold SS, Kaisho T, Hemmi H, Akira S, Reis e Sousa C. 2004., Science. , pp. 303:1529–31. .
99. The role of CpG motifs in innate immunity. Krieg, A.M. 2000., Curr Opin Immunol., pp. 12:35–43. 100. Anendogenous tumour-promoting ligand of the human aryl hydrocarbon receptor. Opitz, C.A., Litzenburger, U.M., Sahm, F., Ott,M., Tritschler, I., Trump, S. 2011, Nature, pp. vol 478; 197-203. 101. Impaired impression of Indolamine 2,3-deoxygenase in monocyte derived DCs in response to TLR-7/8. Furset, G., Floisand, Y., Sioud, M. 2007, Immunology, pp. 263-271. 102. Activationof the noncanonical NF-kB pathway by HIV controls a Dendritic cell immunoregulatory phenotype. Manches, O. Fernandez, V.M.,, Plumas, J., Chaperot, L., and Bhardwaj, N. 2012, PNAS, pp. vol: 109, 14122-14127. 103. Regulation of dendritic cell numbers and maturation by lipopolysaccharide in vivo . de Smedt, T., Pajak, B., Muraille, E., Lespagnard, L., Heinen, E., De Baetselier, P., Urbain, J., Leo, O., Moser, M. 1996, J. Exp. Med., pp. 184,1413-1424. 104. Subsets of dendritic cell precursors express different Toll-like receptors and respond to different microbial antigens . Kadowaki, N., Ho, S., Antonenko, S., de Waal Malefyt, R., Kastelein, R. A., Bazan, F., Liu, Y-J. 2001, J. Exp. Med., pp. 194,863-869 . 105. TRAF6 is a critical factor for dendritic cell maturation and development . Kobayashi, T., Walsh, P. T., Walsh, M. C., Speirs, K. M., Chiffoleau, E., King, C. G., Hancock, W. W., Caamano, J. H., Hunter, C. A., Scott, P., Turka, L. A., Choi, Y. 2003, Immunity , pp. 19,353-363 . 106. Activation of interferon regulatory factor-3 via toll-like receptor 3 and immunomodulatory functions detected in A549 lung epithelial cells exposed to misplaced U1-snRNA. Sadik CD, Bachmann M, Pfeilschifter J, Mühl H. 2009, Nucleic Acids Res. , pp. 37(15):5041-56. doi: 10.1093/nar/gkp525. Epub 2009 Jun 18. 107. Triggering of the dsRNA sensors TLR3, MDA5, and RIG-I induces CD55 expression in synovial fibroblasts. Karpus ON, Heutinck KM, Wijnker PJ, Tak PP, Hamann J. 2012, PLoS One., p. 7(5):e35606. doi: 10.1371/journal.pone.0035606. Epub 2012 May 10. 108. The structure of the TLR5-flagellin complex: a new mode of pathogen detection, conserved receptor dimerization for signaling. Lu J, Sun PD. 2012, Sci Signal., p. 5(216):pe11. doi: 10.1126/scisignal.2002963. .
109. Flagellin/Toll-like receptor 5 response was specifically attenuated by keratan sulfate disaccharide via decreased EGFR phosphorylation in normal human bronchial epithelial cells. Shirato K, Gao C, Ota F, Angata T, Shogomori H, Ohtsubo K, Yoshida K, Lepenies B, Taniguchi N. 2013, Biochem Biophys Res Commun., pp. doi:pii: S0006-291X(13)00779-1. 10.1016/j.bbrc.2013.05.009. [Epub ahead of print]. 110. Differential induction of interleukin-10 and interleukin-12 in dendritic cells by microbial Toll-like receptor activators and skewing of T-cell cytokine profiles Infect. Qi, H., Denning, T. L., Soong, L. 2003, Immun. , pp. 71,3337-3342 . 111. Thoma-Uszynski, S., Kiertscher, S. M., Ochoa, M. T., Bouis, D. A., Norgard, M. V., Miyake, K., Godowski, P. J., Roth, M. D.Activation of Toll-like receptor 2 on human dendritic cells triggers induction of IL-12, but not IL-10 . Thoma-Uszynski, S., Kiertscher, S. M., Ochoa, M. T., Bouis, D. A., Norgard, M. V., Miyake, K., Godowski, P. J., Roth, M. D., Modlin, R. L. 2000, J. Immunol. , pp. 165,3804-3810. 112. Toll-like receptor 2 (TLR2) and TLR4 differentially activate human dendritic cells . Re, F., Strominger, J. L. 2001, J. Biol. Chem. , pp. 276,37692-37699. 113. Pasare, C., Medzhitov, R. (2003) Toll pathway-dependent blockade of CD4+CD25+ T cell-mediated suppression by dendritic cells. Pasare, C., Medzhitov, R. 2003, Science , pp. 299,1033-1036 . This is new to me. You have added tables and figures, and it is well referenced. After a full presentation, you added a short synopsis with key point to remember. Thank you very much for a very important emerging aspect of innate immunity. I’ll be rereading this many times, and perhaps look at some references as well. Your excursion out of infectious disease into a potential cancer vaccine is a real thrust unlike any I have read about. If it is 50% effective, it won’t be enough, but if you add the potential for nutritional metabolic changes, the result could go much higher, or at least in terms of (a) disease avoidance; (b) DFS and remission when malignancy is found. That additional piece could require the suppression of cell plasticity, which would decrease metastatic risk and also favor TCA cycle over aerobic glycolysis. Another idea would be, the possible release of the fumarate-malate step in the TCA cycle that has come into the picture. Thank You. After all everything is created for a simple reason actually. Like we learned after human genome project is completed. only 1% of the genes are used. This is the reason metabolomics and nutrition becomes very important for prevention and remission of disease. I liked the idea of looking into TCA cycle since there is a switch on gene regulation that effect the whole signaling mechanism. These studies may help to improve end failure diseases. on December 13, 2013 at 1:29 AM | Reply IDO for Commitment of a Life Time: The Origins and Mechanisms of IDO, indolamine 2, 3-dioxygenase | Demet Sag, Ph.D.